In 2017, 15,038 new CVEs were published, up from 9,837 in 2016. Last year, 16,500 new CVEs were disclosed. With vulnerabilities growing year after year, patching every potential threat to your business is a futile exercise. The need to prioritize is clear, but where to start, especially when CVSS categorizes the majority of vulnerabilities as high or critical? Enter Predictive Prioritization – a new process of re-prioritizing vulnerabilities based on the probability they will be leveraged in a cyberattack. Predictive Prioritization uses a machine learning algorithm to identify the vulnerabilities with the highest likelihood of exploitability in the near-term future. Take the first step in overcoming the vulnerability onslaught. 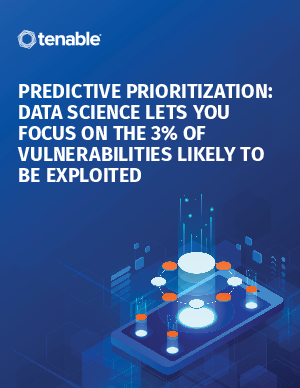 Download “Predictive Prioritization: Data Science Lets You Focus on the 3% of Vulnerabilities Likely to Be Exploited” today.